The children & grandchildren of Meier & Karoline Mayer, c. 1924 Source: The Wolf Collection. 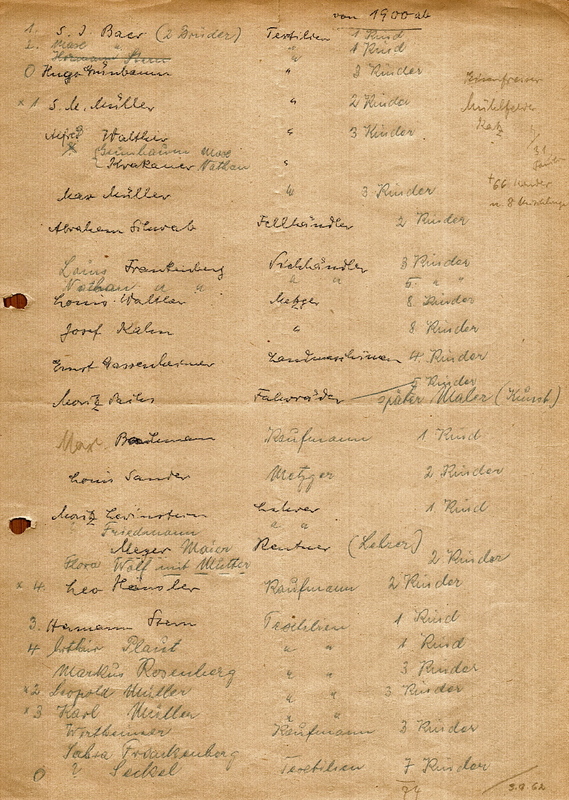 On 3 September 1962 — over 50 years ago — Oskar Stapf, the City of Themar archivist, drew up the list of the Jewish families who had lived in Themar after 1900. 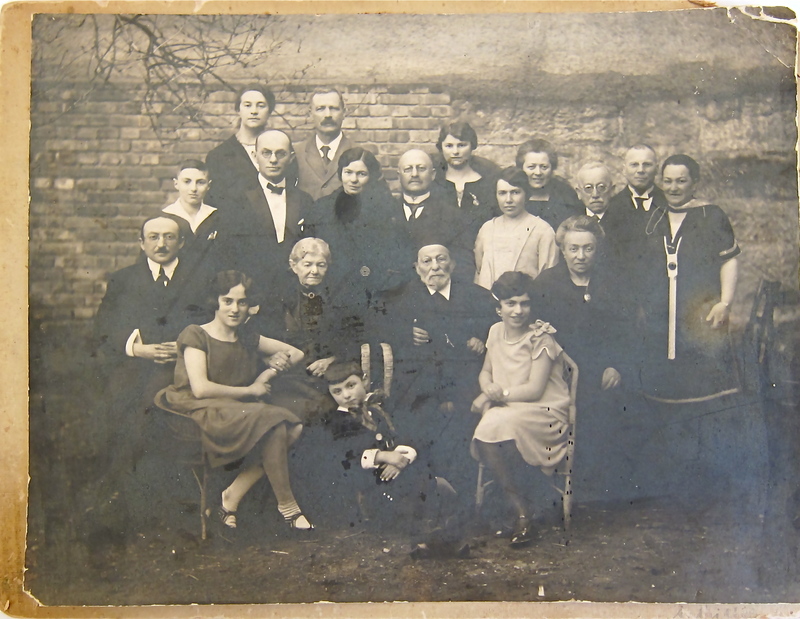 Stapf, born in 1885, had known most of these families personally, and most if not all of the children had attended the Volksschule of which he was principal. Stapf identified the household head, the type of business or economic activity, and the number of children in the family. 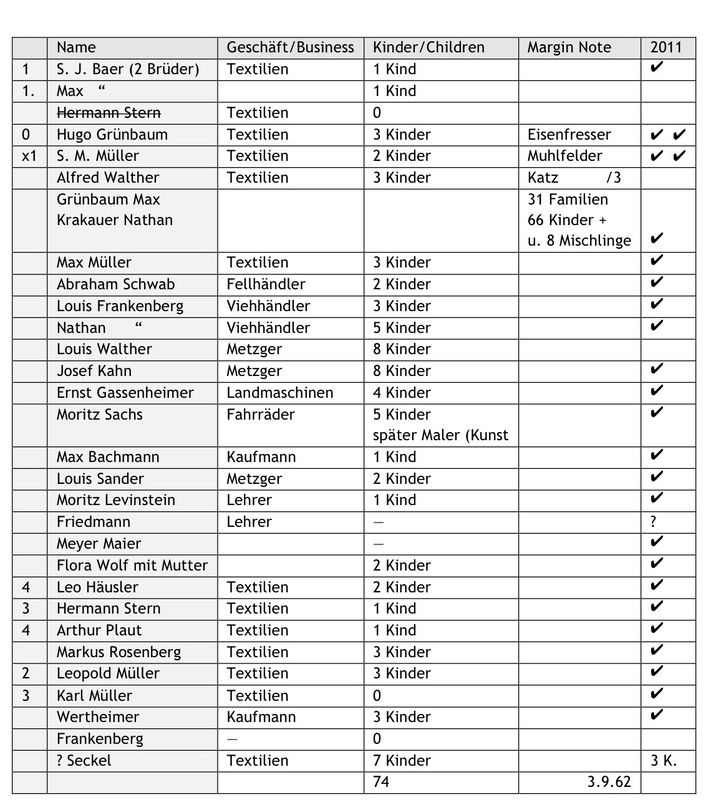 In the left-hand margin are some numbers that have not yet been successfully interpreted, and in the right-hand margin are additional names of one individual, [Klara] Eisenfresser, and two additional families. In all, he counted thirty-three (33) households, 74 children, and eight (8) ‘Mischlinge’ or children of Jewish/non-Jewish parentage. An estimate of the total number living in Jewish families is 147. On its own, the Stapf list tells us some interesting things about what post-war Themar knew about the Jewish community. For example, Stapf believed that ‘S. J. Baer’ represented two brothers/2 Brüder when in fact we believe that the initials stand for Samuel Josef Baer, who took over the Walther store owned by Jette Baer, née Walther, the wife of S. J. Baer. 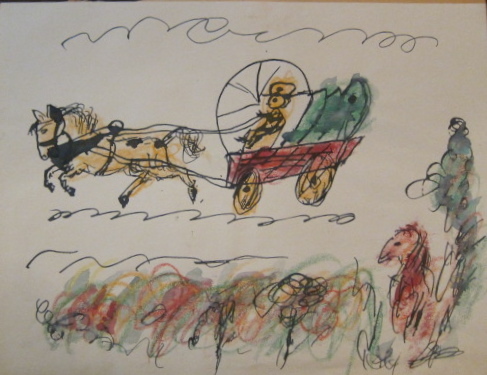 The reference against Moritz Sachs’s name, “später Maler (Kunst)” indicates that Themar knew very early on of Moritz Sachs’s success with water colours, a pursuit Sachs embarked upon in the late 1950s in San Francisco. Fifty years later, Stapf’s list served as the starting point to restore the names of the once thriving Jewish community of Themar. His knowledge and memory were accurate. Most, but not all, of the households identified have been found. (The column in the table to the right labelled 2011 indicates our success in finding the families on Stapf’s list.) The accuracy of Stapf’s memory means, of course, that we are still intent on finding missing family members. In some instances, such as Max Baer or Alfred Walther, we know of them as individuals. But we do not yet know who Alfred Walther’s three children were or Louis Walther’s five children. We now also have a sense of the chronology of when families came to Themar and left again: the Jewish religious official and teachers, the Lehrer, for example, often moved from appointment to appointment on a three-year cycle and we now know of several of these families — Hugo & Eva Friedmann, Friedmanns and the Gustav Hofmanns — who formed part of the Themar tapestry during the late 1800s and early 1900s. The links below take you pages about the Jewish families of Themar.